Today is my blog's first birthday. I want to use this occasion to say thank you to all my readers. This food blogging is quite a time-consuming hobby with all the cooking, photographing, and writing. Looking back, I can definitely say that I my cooking skills have improved. And so has my writing and my photography. My first few posts make me smile now, but I am as proud of them as I am of the lastest ones. They are all part of a learning curve. I am proud of what I achieved in the last year. You want to know some figures? I posted 166 recipes. I've got 88 email subscribers to my blog (OK, one of them is myself and one is my husband) and close to 50 Facebook fans.I have an average of 7.000 unique visitors to my site per month. I always imagine all these people in my garden. That picture makes me proud too.Wouldn't that be a great idea? All people who come to my website could come past my garden and I could serve them a slice/portion/piece of whatever food they were interested in and we could have a little chat. I'd love to do that for a month. What else could I post on my blog's first birthday than a cake recipe!! Not exactly an anniversary's kind of cake, with layers, frills etc. Rather the good old rustic loaf style. 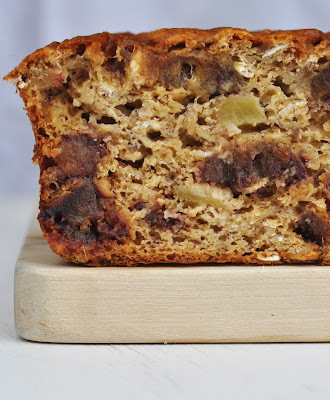 This recipe is a combination of my Banana Date Loaf , my Apple Oatmeal Cake and the Buttermilk Banana Bread. This one takes the best from these three: low fat as a bread, sweetened only with apples, bananas and dates, moist as a cake. Bon appetit! In a big bowl, combine flour, oats, baking powder and salt. Mix well. In another bowl, beat the egg lightly. Then add buttermilk/yogurt, canola oil and mashed bananas. Add wet ingredients to dry ingredients and stir until just combined. Stir in chopped apple and dates. Transfer batter to prepared loaf tin. Bake for 60 minutes or until tester comes out clean. Let cool on wire rack.